Purchase a single article and distribute it to my company, colleagues, patients, students, etc. I would like to request permission to use a text excerpt, image, table, or graph. All SLACK Incorporated publications and products are copyrighted. You may not make copies of any material without prior permission from the Publisher. If you wish to reprint or copy material from a SLACK Incorporated publication or product, you must submit a formal request for permission. Permission is secured only after you have received a reply from SLACK Incorporated. Click on the link that says “Request Permission” on the page where the content resides and you will be directed to the Copyright Clearance Center’s Republication service. Or, visit www.copyright.com and enter the title that you are requesting permission for in the "Get Permission" search box. To submit a request for Books permission, Click here. To submit a request for Journals, Magazines, or Newspapers permission, Click here. To submit a request for Books permission, e-mail bookspermissions@slackinc.com. To submit a request for Journals, Magazines, or Newspapers permission, e-mail publishingpermissions@slackinc.com. Please allow 7 to 10 business days for a response. I would like to include a link on my Web site to connect to a page at Healio.com. You may post a link directly to the homepage or article page of any Web sites owned by SLACK Incorporated. (Example: For OCULAR SURGERY NEWS you may post the link www.healio.com/ophthalmology). You may not post the article on your Web site; when you post a SLACK article online, you are violating our rights of copyright. Please note that allowing a link to Healio does not grant permission to include the Healio or SLACK Incorporated logos on your Web site. Linking to a Healio page does not imply SLACK Incorporated’s affiliation with, sponsorship, or endorsement of your site. I would like to purchase a single electronic or paper copy of an article. Click on the journal article you would like to purchase. Choose whether you would like to see the HTML or PDF version of the article, then click the appropriate icon. Click “Purchase Full Text” button. This will bring you to your shopping cart, where you will be able to complete your transaction. After payment has been authorized, you will receive a confirmation e-mail with the transaction details, as well as a link to the article. NOTE: Articles may be printed or downloaded for personal, non-commercial use. You are prohibited from copying, displaying, distributing, modifying, publishing, reproducing, storing, transmitting, creating derivative works from, or selling or licensing all or part of any content obtained from this site. If you would like to purchase a paper copy of an archived article, please contact Customer Service at 1-800-257-8290 or 1-856-848-1000. I would like to purchase a single article and distribute it to my company, colleagues, patients, students, etc. A Customer Service Representative will respond in 72 hours or less. If permissible, a fee will be required. Some uses will not be allowed. I would like to post an entire article from Healio.com on my Web site. At this time, we do not permit users to post any full articles on their Web sites; when you post a SLACK article online, you are violating our rights of copyright. You may post a link directly to the homepage or article pages of any Web sites owned by SLACK Incorporated. If you have any questions, please contact Customer Service at 1-800-257-8290 or 1-856-848-1000. I would like to post an entire SLACK Incorporated journal article, authored by me, in my institutional repository. 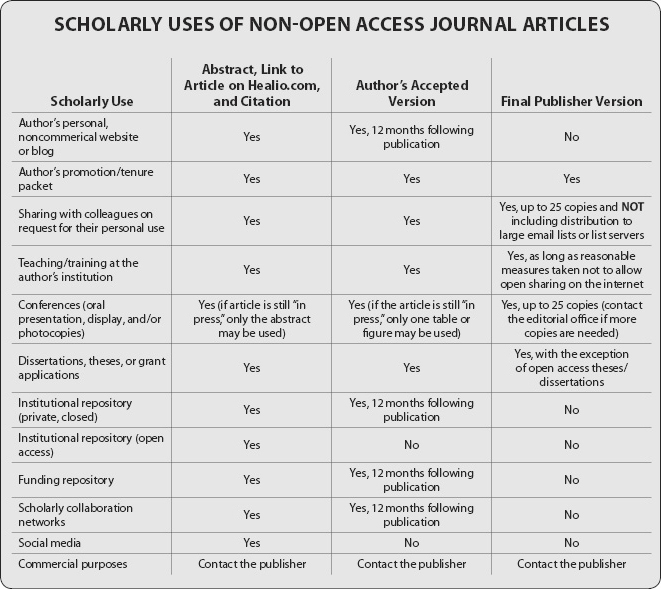 Acceptable uses of SLACK Incorporated journal articles that are not published open access are outlined in the chart below (click to enlarge). Articles that are published open access in a SLACK Incorporated journal may be shared at any time as long as the applicable Creative Commons license is observed and remains in place. I would like to license the use of material from Healio.com for a specific use. Please contact Stephanie Arasim Portnoy at sportnoy@slackinc.com if you are interested in licensing the right to include SLACK Incorporated content in your products and services. Relevant information regarding the content: publication title, article title, author, publication date, etc. I would like to make a different request not listed here.